QuickBooks Online Software allows you to access your business accounts from anywhere you have an internet connection – your laptop, computer, tablet or smart phone. It also allows more than one person to have access, so you can give access to your bookkeeper, your accountant, your admin, other business partners etc. 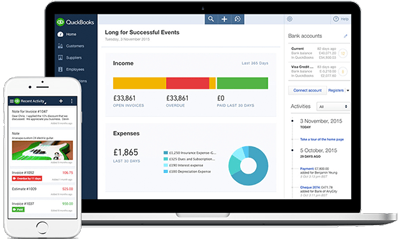 It’s the world’s number 1 online accounting software that has over 1.5 million subscribers and is the highest rated mobile app for accounting software with 4.5 stars. It can be linked directly with many other apps – for example Receipt Bank, Amazon, Float, PayPal, Xpenditure and GoCardless to mention just a few. Your business bank account can be linked with it to give you a certain amount of automated payment entries. All of the above and more make it a software that gives accurate & up to date information about your business – but only if it’s set up correctly. Let Lady of Ledger help you set this up correctly, so that you can get the best out of the software. You can purchase QuickBooks Online (QBO) direct from QuickBooks.co.uk or from Lady of Ledger Bookkeeping Ltd. We can often give you a better discount than you can get direct – so drop us an email on info@ladyofledger.co.uk and let us know your needs and quote you.